There should be no more “ifs”, no more caveats and qualifications. After trillions of printed illusions through four QE’s and now almost seven years of ZIRP, she still can’t say for certain whether the economy is actually performing. However, the fact that Janet Yellen won’t say so is all the evidence you need, as for surely by now, especially given all the heated and self-congratulatory rhetoric of last year, there should not be any more doubts. But there is, the Fed is clearly scared about it and Janet Yellen finally admitted it in unadulterated fashion. She, of course, reiterated that she would prefer to raise rates and exit this year but all these “unexpected” downgrades are undoubtedly weighing. The Establishment Survey has been surging from more than a year, and suddenly that isn’t enough? The unemployment rate, for which Ben Bernanke has claimed as his prize contribution, is now abruptly suspect? If you actually “hear” what Yellen said, it is every criticism of the BLS-version of the economy in its most intimate form. It had to be difficult for her to speak it, given how greatly serious the recovery was expected to be in full bloom right at this point. 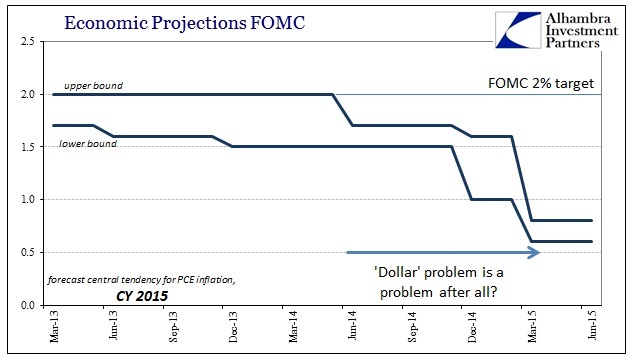 Just one year ago, all expectations were for perhaps a March 2015 rate hike, but June 2015 for sure. Now, there is doubt about 2015 at all. My survey of economic data of late has been uniformly negative, and especially so. This is so far beyond the usual, Stanley Fischer-type disappointment as to be more and more exclusive of anything but forming contraction. The only measure of statistically-drawn hope is and has been the Establishment Survey, and here is Janet Yellen, who has held it especially close this past year, essentially today throwing it out. That cautious approach is actually quite consistent for Yellen since she first took over from Bernanke in February 2014; and that is the problem. By now all the talk about “slack” should have dissipated into the storm of economic surge. Since wages, slack and “inflation” are all tied together in the orthodox mix, the fact that “inflation” continues unabated by monetary efforts is actually a dangerous, visible gauge of ineffectiveness. The Fed’s biggest fear, what you hear behind Yellen’s words, is that the economy “unanchors” to where the FOMC wants it. The job market has not healed completely, but Ms. Yellen and other Fed officials say the economy is now strong enough to allow them to start raising rates toward more normal levels next year. Employers added, on balance, a monthly average of 224,000 jobs over the 12 months ending in November, including 321,000 jobs in November. The unemployment rate has fallen to 5.8 percent from 7 percent. The Federal Reserve isn’t spooked by the sharp oil-induced declines in inflation the world is now witnessing. That is one of the more important messages to emerge from Chairwoman Janet Yellen’s press conference Wednesday after the central bank released a statement indicating interest rate increases are likely next year. Instead, her emphasis remains on diminishing slack in the labor market. Ms. Yellen’s bottom line, repeated several times during the press conference: If core inflation – excluding volatile food and energy prices — remains stable in the coming months and the jobless rate continues to fall, that should be enough to convince policy makers that it is time to start raising rates. The energy price decline is seen as transitory, but the reduction of slack as fundamental. And now, seven months later, Janet Yellen herself has said, basically, throw all that out as now they are spooked; the Establishment Survey has become unreliable without much else to base recovery expectations upon. If the economy were truly gaining, there would be unambiguous wage growth as well as surging participation. By recognizing, now, all those “missing” workers she is essentially endorsing the end of the recovery as it was supposed to be out of 2014. That doesn’t mean, however, she and the FOMC are seeing the same recessionary forces that I do, but I think it does mean that they are now concerned that it isn’t as remote as it was thought just four or six months ago. After all, the “dollar” doesn’t rise, and oil prices crash, in anything else. Everything about this year has been atypical even for the severely reduced standards that pass for economic judgment since 2009 and I believe Janet Yellen just admitted that. With labor participation again declining since January (and January’s surge likely nothing more than a statistical discontinuity) there really wasn’t another course for Yellen to take. Perhaps there should be some grudging respect for her candor now instead of falling back into nothing but the usual rational expectations clichés about future expectations. Given the trap the Fed has put itself, and us, into, however, I don’t think she had much choice this time but to admit the obvious. A little more than a year ago, I suggested that the worst case for the FOMC was to be at ZIRP when recession hit. I think that was correct, but is now dated. With circumstances this year moving far quicker and, more importantly, the economy staying down far longer, the worst case would be for the FOMC to raise rates once, maybe twice, and then have recession and be “forced” back to ZIRP in short order. I never thought they would get that far to begin with, to end ZIRP, and it may be just that Janet Yellen acknowledged as much; if she were really as intent as she projects on exiting she would have simply kept with the unemployment rate and Establishment Survey as good enough. I think that conforms a little too closely to what I wrote last month about the last FOMC policy statement in that Yellen and the committee are nothing more than trying to convince or scare a recovery into existence. 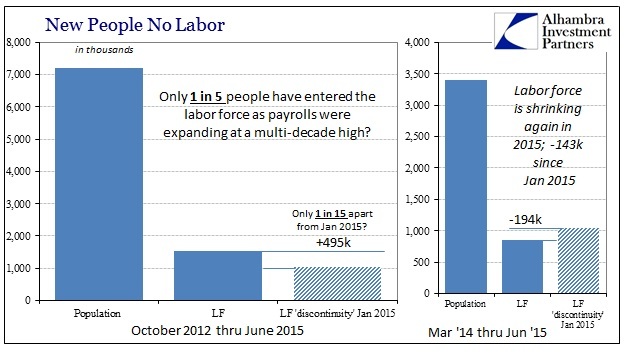 If the recovery was there, they would do it already and call the unemployment rate enough evidence. Instead, they still “have” to say the recovery is there (rational expectations), but since it isn’t there they have to recognize a way out of that stance. In other words, by unofficial official count, the recovery of last year and the year before just disappeared. She will still project all the same optimism in platitudes, but without the unemployment backdrop. She and the FOMC risked total discredit by continuing to rely on that measure which has, so far, produced all of nothing but misdirection. It took some time, but reality has finally caught up. They may still see some upside to the economy later this year, but what is far more importantly implied by Yellen’s speech is that the downside probability has changed for them, and not by a little. Inventories are a key component of gross domestic product changes. 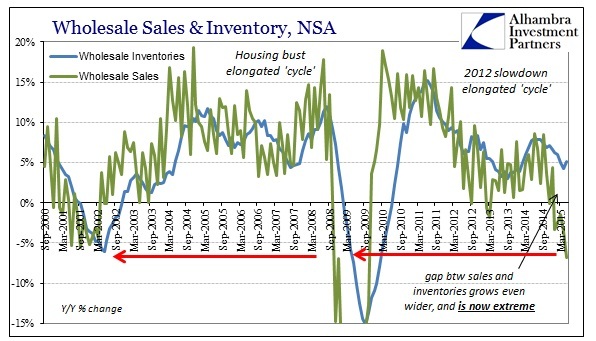 The component that goes into the calculation of GDP – wholesale stocks excluding autos – rose 0.8 percent, suggesting inventories will provide a boost to growth in the second quarter. The economy contracted at a 0.2 percent annual pace in the first quarter and growth got off to a slow start in the second quarter, in part because of the lingering effects of a strong dollar and spending cuts in the energy sector. But data since then, including in job growth, suggest the economy is picking up steam.